Eyeteeth: Incisive ideas: Apes and race. A week ago BlackBloggah wondered aloud whether King Kong director Peter Jackson is a "sly racist hiding behind so-called 'classic' stories or is he unaware that his movies are soaked in racist imagery and the logic of genetic determinism?" 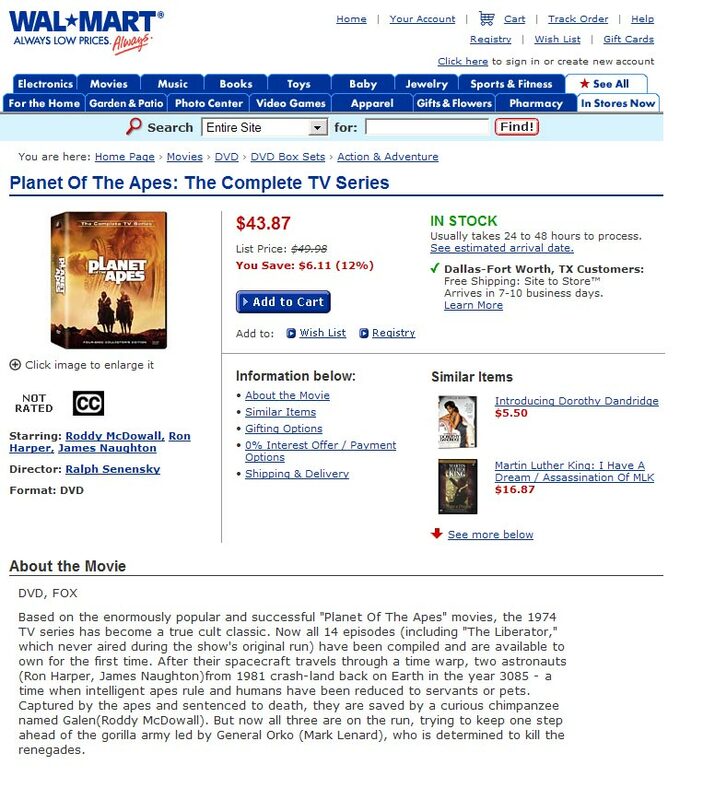 Now Wal-Mart is accused of conflating apes and blacks: their online product listing for the DVD Planet of the Apes has a "similar items" link to the DVDs Martin Luther King: I Have a Dream and Introducing Dorothy Dandridge (screengrab here). Racist recommendation or fluke? Perhaps this wouldn't be such a problem if Jackson had digitized Snowflake for the lead.